— BugsInTheNews is a viewer-participant website. This article by Jerry Cates and Terri, first published on 16 August 2010, was last revised on 6 July 2012. © Bugsinthenews Vol. 11:08(09). Terri and I had been corresponding about a large fishing spider whose antics she was following in her barn. Now that spider had disappeared (fishing spiders don’t hang out in one place very long before moving on), and she turned her attention to another spider that was being found in abundance inside her cathouse (she points out that the building contains no loose women or hookers, just cats and dogs she lovingly rescues and cares for). Will you please tell me who these beauties are? NOTE: The photos in this post, like those in all the posts on bugsinthenews.info, can be viewed enlarged for closer analysis by simply placing your cursor over them and clicking. In most cases, the enlarged photo can be enlarged even further by clicking again on the enlargement. Clicking on the back arrow will return you to the posting itself. The American house spider is also known as the common house spider. Taxonomically it was listed under the binomial name Achaearanea tepidariorum from 1955-2008. For many years, though, the species was thought to be in the genus Theridion. The arachnologist Allen Frost Archer (1908-1994) proposed a new genus, Parasteatoda, that was in vogue from 1947 to 1955, for a group of species that included this spider, and many arachnologists used that generic name exclusively to the present day. However, the eminent arachnologist Herbert Levi, in 1955, concluded in the course of a thorough scientific study that the species belonged to the genus Achaearanea, and most authorities concurred until a major 2008 revision concluded that Archer’s 1947 designation was correct, after all. I mention this to point out that, even though this species was first described long ago by Carl Ludwig Koch (1778-1857), some controversy remains to the present regarding its taxonomical placement. 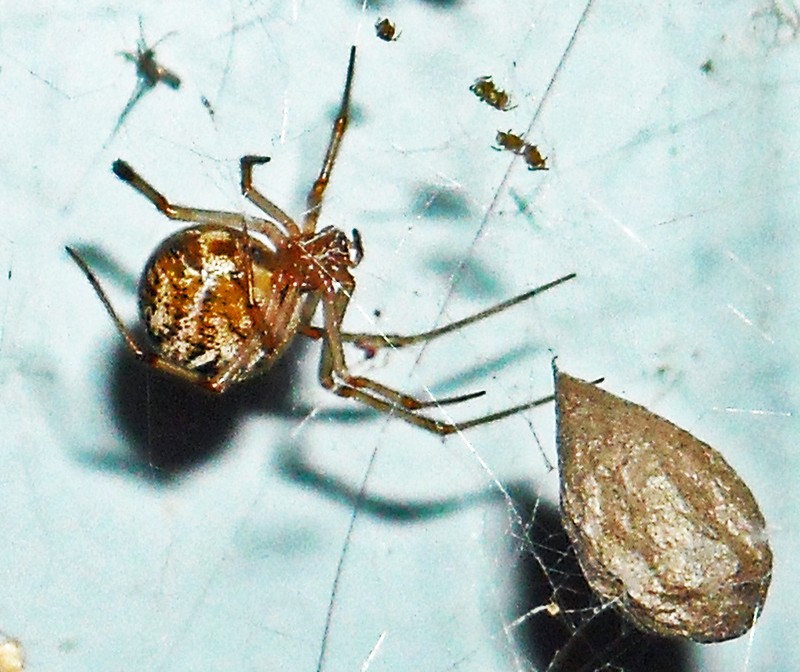 There is no argument, however, regarding its broader inclusion within the Theridiidae. This spider is in the same family as the black widow (the most infamous member of the Theridiidae), but its venom is generally not at all dangerous. One case, however, in Gainesville, Florida, is reported to have produced a serious allergic reaction. The American house spider will bite when provoked, and is considered one of the most abundant spiders found in the company of man. The species is so notoriously synanthropic that getting bitten by one can be a fairly common experience. The bite (I speak from personal experience, having been the recipient of this spider’s miniscule wrath on many occasions, usually while cleaning out a garage or a storage shed) typically produces a small, raised swelling that resolves in one or several days without complications. The egg sacs (see the tear-drop, paper-like structure in the web shown in the first photo of this post) contain 100-400 eggs. A single female is capable of producing up to 17 egg sacs over her average 12 month lifespan, or practically one and a half egg sacs a month. Notice, however, that the number of egg sacs produced, the total number of eggs inside each sac, and the survival potential for the spiderlings that emerge, are all tied–in a more or less linear fashion–to one main factor: the abundance of prey. Reductions in prey mean a corresponding reduction in reproduction and survival within the spider population. 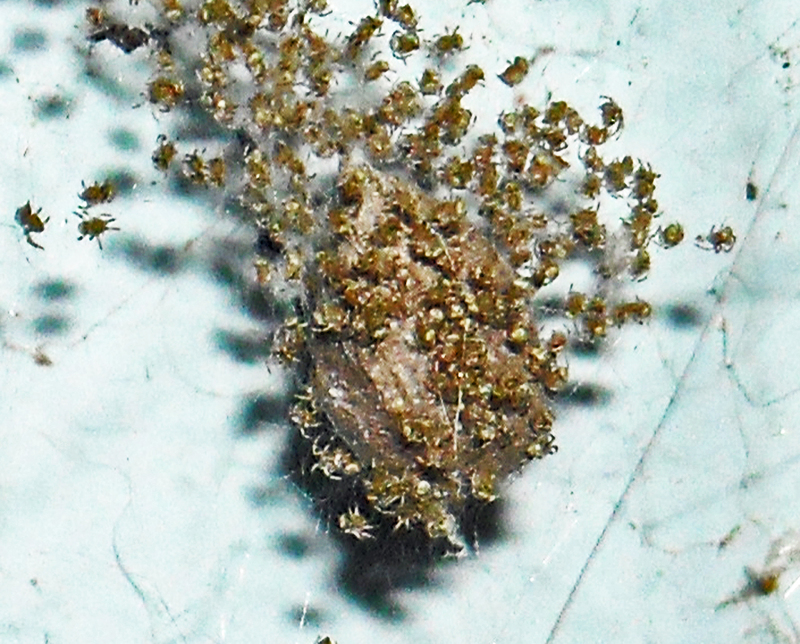 The photo at left, which is an enlargement of a portion of the original Terri sent me, shows another egg sac (in the background) covered by a multitude of recently hatched spiderlings (in the foreground). It is a testament to the prolific reproductive capabilities of this spider that the one photo Terri sent showed not only a recently constructed egg sac but also another that had just ruptured so the tiny spiderlings inside could emerge. These spiders feed on flies, mosquitoes, ants, wasps, and just about anything that manages to become ensnared in its cob web. Frequently cockroaches, grasshoppers, crickets, baby geckoes, skinks, and other animals, will become entangled in the strands, especially if they are attracted by flies and other insects that they see struggling to get free. Such animals often become part of this spider’s menu for that day and the several that follow. Because these spiders are so prolific, and because they do not periodically dismantle and rebuild their cob webs the way most orb weavers do, their presence in a home is the source of most of the accumulated spider webs that housewives, maids, and housekeepers fuss over as a significant part of their daily, weekly, or monthly chores. It is common to receive e-mails from homeowners and others who wonder how best to deal with the cob webs these spiders produce. For many years, my standard response was to manually remove them with a long-handled housekeeper’s duster. The problem with that response was that the cob webs were immediately rebuilt, so that the job had to be repeated, sometimes daily. Today, after much reflection and study, my response is not so simple. It makes sense to begin by taking on a basic habitat modification program that reduces the prey these spiders will encounter inside the area where the spiders are making their mess. Once their prey is reduced, the spiders will become less of a problem, as their web-building and reproductive capabilities are driven by the amount of prey they consume. Next, ordinary soap-and-water solutions can be used to wash up the areas where these spiders are found. The link to my page on spider extermination is provided at the top of this post, and goes into the logic behind this in more detail. In addition to the soap-and-water solution, a natural, plant-oil based cleansing spray that actually weakens the silk in the cob webs these spiders spin, can be a good adjunct. Natural cleansers leave behind a pleasant, refreshing fragrance that lasts for days. Using the cleansing solution of your choice, and thoroughly cleaning the surfaces where these spiders have congregated in the past, you will automatically produce an environment that does not attract or nurture them.